two days into the new year, and it's already been a roller coaster of a year - weather wise, at least. yesterday i basically stayed rugged up in a blanket burrito all day, watching the rain bash against the window while eating all of the left over food in the house, and then this morning i wake up to beautiful blue skies, and am filled with motivation. i mean, i'm still in bed, naturally, but i'm *thinking* of going to the gym as soon as i finish writing this post, so.. baby steps. last day vibes | the last week of work was suuuuh quiet. literally a tenth of the usual amount of people in the office, and very little work to do. it sounds great in theory, but in practice, it was utterly dull. towards the end of the week we wore our managers down though, and managed to skip out of the office a day and a bit early, which was a fabbbbb way to start the christmas break - for sure! deck the doors | i will be so sad to see all the wreaths come down off the colourful doors of london. christmas certainly is a different sort of affair in this country than it ever was in australia, and i will never tire of how "christmas filmy" it all is comes mid-november. the first week of january is going to be a really atmospheric bummer. waaaah! a country escape | bex and i took a coach (ugh) to cheltenham on christmas eve, to visit her family in the cotswolds. the coach was dire, and i do not recommend that. the fact that paddington closed that day meant that any train would have gone via birmingham, an added county out of the way, so we took the road less travelled. and it was regrettable. but, once welcomed into the country with opened arms and bottles of prosecco, everything was right again. especially when you consider quaint english village vibes, beautiful blue skies, and crisp, country air for four whole days. not that we left the house much, of course, because the prosecco lived indoors. it was a wonderful break, and it was the perfect way to end a stressful year.. did i mention all the prosecco? christmaaaaas | honestly, opening presents in front of an open fire, with a room full of laughter, hot coffees in hand, jazzy christmas music playing in the background... this christmas was easily the best christmas i've had in such a long time. i literally don't remember the last time i had a stocking to open on christmas morning.. or such amazing people to spend an amazing day with. this christmas was one for the books. 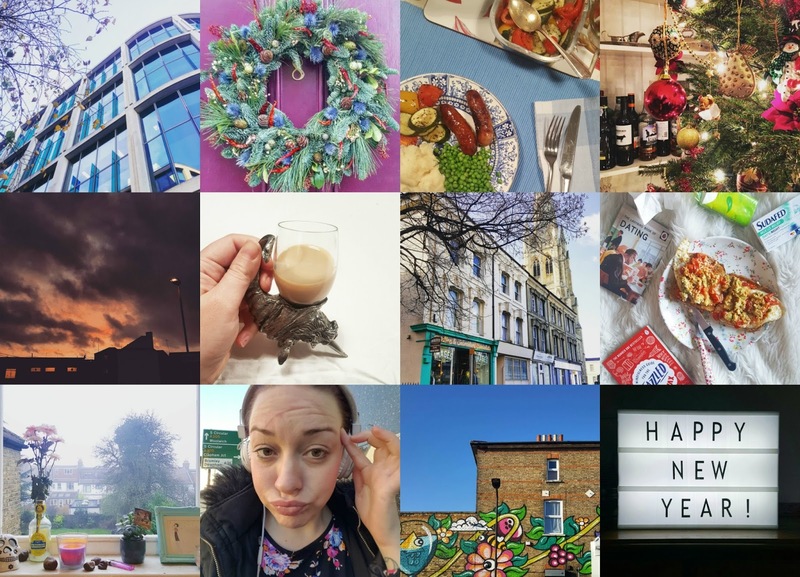 self care | i'm not doing resolutions - not real ones, but i'm making a promise to practise more self care this year. i'm going to get my hair cut and use moisturising cream, and go to the gym, and eat more greens. i'm going to get a massage when i need it, and not feel guilty for staying in bed when i'm feeling low. i bought a SAD lamp with some christmas money, and i've been using it religiously. has it made a difference? i think so, but i might just be blind now and seeing the world in a different light. to read | oh my god, my "to read" pile is massive at the moment, and i had thought i would get through it all over this long break, but so far: nada. just before christmas i was sent ruby wax's "a mindfulness guide for the frazzled" and i was sure i would have it read and be practising some new techniques by now, but alas... sleep has been getting the better of me. sleep and netflix. i've found so many things to watch, and i'm not even going to apologise for my laziness, because it's been absolutely bliss. now, i'm looking forward to getting my read on when i'm back on the daily grind. lord knows i'll need it then! happy new year! | i spent the night watching ridiculous films (sausage party, anyone?) with my flatmates, eating home-made pizza, drinking home-poured cocktails and snacking on cheese twists until midnight when we opened the windows and listened to the blitz rain down outside. and sang along to robbie on the telly. and then went to bed by 12:30. it was the perfect new years, and i couldn't have asked for a better night. except for one where i got to wear my new dress, and not lounge in my pjs. ah well, next year! rest and relaxation | almost a week spent between pjs and gym gear and my slobby, germ-ridden bed, and it's been pure bliss. i've hardly seen anyone outside of this house - in fact... i can't remember the last time i saw someone who wasn't my flatmates or folks from the gym... and it's been perfect. never feel guilty for taking time for yourself, team, self-care and me-time have been some of the most important things for me personally lately, and i reckon - based on the evidence from this week, i'm nailing it. happy new year guys, hope yours has started with a bang too!